Yes, it was indeed a marathon but for coding – coding continuously for 24 hours to create and complete an app in a day, requiring a lot of diligence and pre-planning. Over 50 Teams of 250 Developers from all over India including Coimbatore, Chennai, Surat and Rajkot participated in Hackathon. We were also attending AppFest2013 with 20 Space-O Team Members divided in 2 Groups – KickAss iPhone Developers and Ninja Android Developers. And this was the first time we were participating in any such event and we won it. App Feasibility – To ascertain the feasibility of our idea, we conducted a survey of 106 users and discovered the fact that there are over 6200 books available for Barter Exchange (which was the core idea of our app) in the IIM itself right now! Commercial value of those books is more than 18 lakhs. Branding – Believe it or not but this is how audiences connect with the organization. It was not a requirement or rule though we were wearing our brand “Space-O” with our company logo imprinted on our Tee Shirts. People acknowledged brand “Space-O”. Teamwork – This is the prerequisite for any team’s success. And we worked as a team without assuming responsibilities by our titles of CEO, Project Manager or Developer. Our aim was to execute for which we were never hesitant to undertake anything beyond our individual roles. For example, when our mobile app developers and designers were working on applications, we (CEO and managers) provided them with everything they needed from refreshments to resources. Sportsmanship – We believe in true sportsmanship and put it in our practice. We volunteered during the event and offered our technical and administrative help to participants other than our team as well as to event organizers wherever they needed our aid. Among 40 different apps which were developed overnight “Book Barter” by Space-O was pronounced and chosen as a winner at Hackathon. Read more about Book Barter and Space-O Developers who won Hackathon. The competition was tough though I guess we already hacked the show. 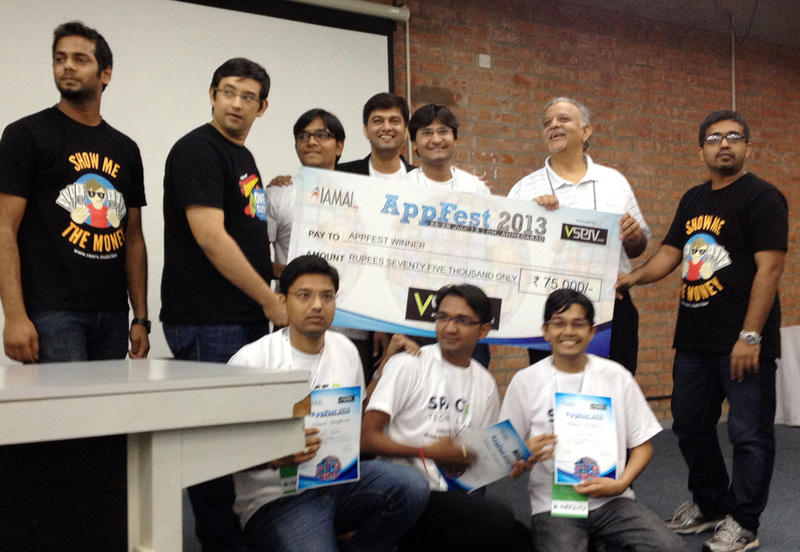 One of the jury members considered Space-O as the IBM and Microsoft of the AppFest2013. Hackathon Victory covered by Times of India and BuddyBits.